Jane Takagi-Little is a Japanes American, an aspiring documentarian, and recently divorced. Broke and freezing in her apartment, a job is miraculously handed to her by an old friend in Japan. Just like that, Jane becomes the director of a new television show, “My American Wife!,” sponsored by Beef-Ex: an American meet company looking to expand its market to Japan. During her time working on the show, Jane becomes more influential than she could ever have imagined. “My American Wife!” seeks to portray only white, beautiful, American wives cooking delicious beef, but Jane strives to show the Japanese audience the diversity that is present in America. So begins Jane’s foray into not just television, but the American meat industry and the many horrors it can hold. One of the Japanese people viewing the show is Akiko Ueno, the wife of the abusive and controlling Joichi “John” Ueno. John is also the producer of “My American Wife!” and aside from abusive and controlling, is horribly racist even towards his own culture. Akiko is inspired not just by Jane and the ways she defies her husband in a way Akiko herself cannot, but by the women featured on the show. What unfolds is a story that intertwines in the best way possible, and just goes to show that Ruth Ozeki is the best, forever, thank you and goodnight. What was especially great about this book is that it was written in 1999 (!!!) and is still incredibly relevant today. There is more awareness today about the way cows are treated, and more knowledge of sustainable farming, but there is still a long way to go. Many of the facts presented by Ruth Ozeki about the meat industry come from her own time spent working on a television show sponsored by the meat industry, and the lessons she learned little by little. My Year of Meats was her way of coming to terms with her own chosen ignorance during that time, and uses her work to opens the eyes of her readers, so that they can no longer choose to be ignorant to reality. Fed on a media diet of really bad news, we live in a perpetual state of repressed panic. We are paralyzed by bad knowledge, from which the only escape is playing dumb. Ignorance becomes empowering because it enables people to live. Stupidity becomes proactive, a political statement. Our collective norm. I’ve never really been a red meat eater, but if I was, this book would haven ended that pretty much immediately. The discussions of the treatment of the cows, the slaughterhouses, and the industry’s ability to turn a blind eye and pump their animals full of antibiotics and hormones knowlng full well the harm they do to Americans is brutal, and rightfully so. Ozeki writes with incredible honestly to create a fictional narrative of something that was very real to her. I loved A Tale for the Time Being back in September, I loved My Year of Meats, I even loved Ozeki’s section in Mistakes I Made at Work. If you haven’t read Ruth Ozeki yet, believe me when I say you’re missing out! My Year of Meats was the perfect first novel to start of the year, and I’m hoping is a sign of all the great books it has in store. My thesis advisor just recommended this book to me, but said I wouldn’t eat red meat for months afterward. Now I’m torn between my desire to read the book and my love for hamburgers! It does get pretty graphic, but I still recommend it! Plus, I think farming now is probably better than it was then! 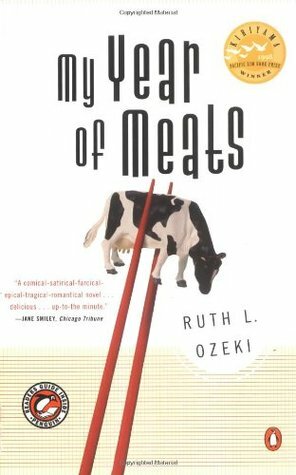 I read My Year of Meats after discovering Ozeki through A Tale for the Time Being and found it really thought-provoking too. 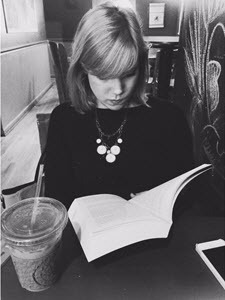 I hope to read All Over Creation this year. I loved A Tale for the Time Being too! Ruth Ozeki tells stories in such an amazing way.